The Amy Brown Collection from the Anonymous Mint captured the imagination of silver buyers, collectors, and fans of Brown’s artwork with six beautiful designs. Now, a special-edition design is added to the collection for the fall season and Halloween. Right now, 1 oz Proof Silver Amy Brown Collection Haunted Pumpkin Patch Rounds are available to purchase online at Silver.com. Ships to you inside of a protective capsule and comes with a Certificate of Authenticity! Issued just for the Halloween season! 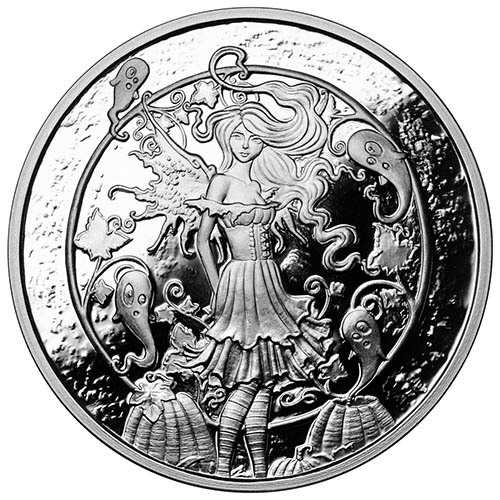 Haunted Pumpkin Patch and fairy design on the obverse. Dusk is featured on the reverse. Fairy design by Amy Brown and round creation by Julie Lindquist. Individual serial numbers on the edge! 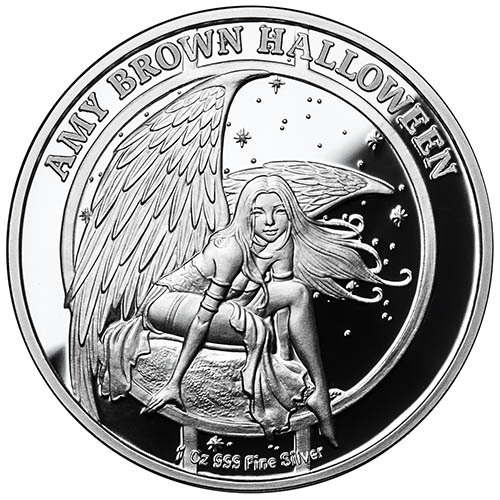 Each of the 1 oz Proof Silver Amy Brown Collection Haunted Pumpkin Patch Rounds in this listing comes to you with a protective plastic capsule. The rounds each have their own unique serial number engraved on the edge and the COA comes with that same serial number written on it. The 1 oz Proof Haunted Pumpkin Patch Round has the standard visual features of a proof silver round. Proof rounds have frosted design elements and mirrored backgrounds, and these represent just one of six options available in this release. The 1 oz silver rounds come with proof, antique, and colorized designs, all of which are also available on 5 oz silver rounds. On the obverse side of 1 oz Proof Silver Amy Brown Collection Haunted Pumpkin Patch Rounds is the image of a fairy standing inside of a haunted pumpkin patch. Two white ghosts emerge from the pumpkins at her feet, while an additional two ghosts play with her long hair near the top of the design. The moon in the background is encircled by the leaves and vines of a growing pumpkin. The reverse face of 1 oz Amy Brown Collection Haunted Pumpkin Patch Rounds includes Dusk. The fairy known as Dusk watches over the fairy realm during the dusk period of the day. She sits at a high perch on a rocky cliff, her dreamy gaze staring out over the horizon to keep an eye out for any problems. The Amy Brown Collection is the work of the Anonymous Mint. Lead coin designer Julie Lindquist develops the designs and Italian Master Sculptor Luigi Badia carved the designs for each round into blanks used for the production of these silver rounds. If you have any questions, please don’t hesitate to contact Silver.com. Our customer service team is available to you at 888-989-7223, online using our live chat service, and via our email address. Don’t forget that you can always find the latest price of silver on our website as well!